One of my coworkers wanted to go to the nearby used building supply store. I have a few things on my "want" list so I took some measurements and we took my truck over to the store on our lunch break today. One of the things on my list is a vanity cabinet to replace this light blue particle board and plastic monstrosity. 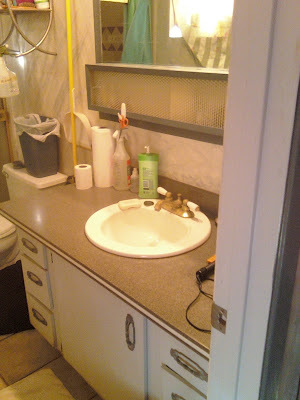 They had one 4 foot vanity that I liked but it came with the top counter and sink which I didn't like. I could have just bought the whole thing and given away the top but I didn't like the vanity THAT much. I think it cost $280 which is a good price since new ones start at $350 at Home Depot. Plus, this one was solid wood and the ones at Home Depot are made of cheap press-board. It is important to know the prices and quality of the building supplies so that I can grab a deal when I see it. I'll keep looking. They get new stuff there everyday. I was also looking for 2 exterior doors but my measurements were wrong so I didn't find anything. 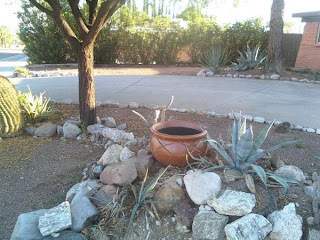 As we were leaving, we looked at their assortment of decorative pots and my coworker found 3 small ones that she liked. I wanted a big one but didn't want to pay $30. I saw one that had a 3" piece missing from the rim so I asked the guy if I could get it for a discount. He said $5 so I was very happy. It doesn't look that big in my yard but I think it looks great and the broken part is barely noticeable. It fits nicely in the place where my agave was. The agave just bloomed and they die after they bloom so I had an empty space. I'll probably transplant one of my smaller cacti in to it eventually. I'm just glad that I have something decorative in my yard that doesn't need water. It looks lovely. I am still not used to a garden which doesnt have grass though, which comes from living in the land of bloody rain! It took me a while to get used to it too. Growing up in S. California, everything was over-watered and had that tropical jungle look. Now I drive by lawns and say tsk, tsk, wasting water! There is one lawn on my street. It is pretty small. I like to shop for used building supplies in Fayetteville. You might not get exactly what you were looking for, but you might find something even better! Hi Earl! That place is ritzier than any of the used building supply stores here in Tucson. Looks like a high-end showroom!